I will explaining how to draw your own pattern for a basic pencil skirt. - a piece of elastic band, long enough to tie around your waist. For a skirt you only need to take a few measures: your waist, your hips and the distance between the two. The length of the skirt,of course . When taking measurements, wear something tight-fitting and make sure that you place the tape measure around your body without over-tightening it. To measure your waist, use the elastic band. Tie the elastic band around your waist and whiggle a bit, the band will automatically position itself on the spot where your body has the smallest circumference. Then measure, without tightening your tape measure too much. For your hips: make sure that you really measure the widest part of your hips. Then measure the distance between the elastic band in your waist and the widest part of your hips, it should be around 20 cm. Now you’ve got the measures you’ve got everything to get started. Line A – C: Start with a vertical line, this will be the length of your skirt. Line B – D: half of your hipwidth + 1 cm. The extra width ensures that your skirt will be comfortable and not twist around your hips when you’re walking. B – E: half of distance B-D, plus 1 cm. You notice that the front piece is slightly broader than the back piece. D-F: half of your waist circumference. 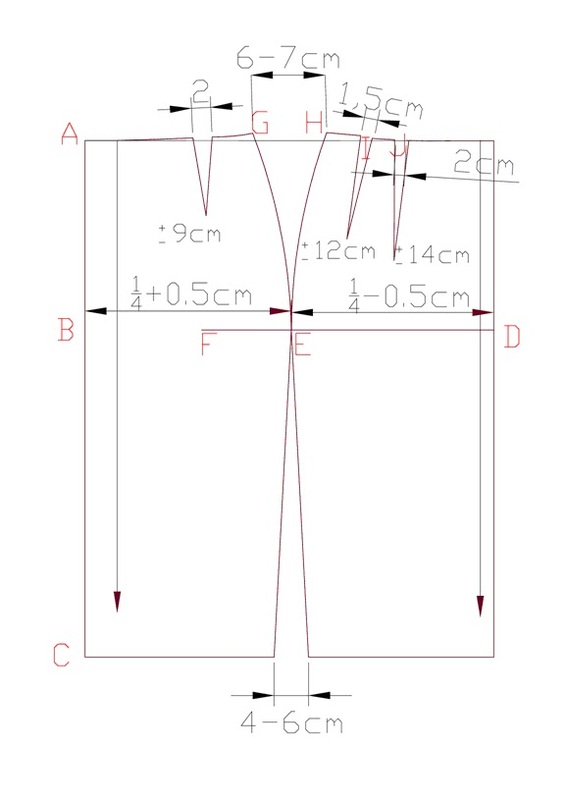 The distance left over between B and F equals the distance that needs to be taken out at the waist line to get a nice fitting skirt. The distance G-H is 6-7cm. Draw point G and H one cm above the waistline, that will give a better fit. Never take out more than 2 cm at the front side of your skirt. Dart I is 1,5-2 cm wide and the dart J is 2-2,5cm.